Maximising your potential. It is something we all do at one time in our lives – we read an inspiring autobiography, watch a late night documentary on television or immerse ourselves in the aura of latest motivational speaker. But surely there must be a better way? A way in which we can distill the essence of ‘real people’ who achieve success through adversity, people with no agenda to profit from our appetite for self-improvement. That’s the premise behind the Maximise Potential programme set up by Jenrick Group – to help people succeed in life, their careers and business by listening to original inspiring interviews from those who have overcome their limitations and delivered their full potential – whether that be scaling Everest, winning a paralympic gold or growing a successful business. During the course of more than 30 interviews certain ‘trends’ began to form, and so the obvious next step was to capture these in a framework for easy reference. During the journey towards achieving their goals, each of our interviewees took a close hard look at any obstacles in their path and set about changing them. The first step in this process, whether consciously or not, involved aligning their vision and sense of purpose with these goals. This starting point, or anchor, is common to all who have sought to realise their maximum potential. Those of you familiar with the tools of Neuro-Linguistic Programming (NLP) will already recognise this process as Logical Level Mapping – understanding where within our personality profile things need to change, in order to achieve superior performance. Environment: the surroundings, people and places that we are interacting with. Behaviours: any inappropriate physiology or actions adopted (for example, breathing, tension). Skills & Capabilities: the innate capabilities and/or learned skills we possess for dealing appropriately with an issue. Beliefs & Values: whether we believe something is possible, necessary and if we feel motivated to achieve it. Identity: our self esteem, sense of self and what we identify with (for example, being a winner or an underdog). Mission: the activities and places that are central to our vision of life and the contribution we intend to make in the world. The intrinsic lesson we learn from neuro-logical mapping is that the greatest capacity for change occurs at the ‘deepest’ levels (i.e. our beliefs and sense of purpose). This explains why every successful sports person spends at least as much time training their brain as their body. We spoke with more than 30 high-achievers including athletes, mountaineers, explorers, corporate executives, business advisers, journalists and designers to understand what it took for them to achieve their potential. We then analysed each transcript, extracted the key words used and distinguished between their implied and stated meanings. Finally we performed some rudimentary Multivariate Analysis (MVA) to isolate the cognititive patterns across the sample group and the factors most likely to influence them. A consistent quality to arise from our study was that of being “true to yourself”, closely followed by “perfectionism”. Around 7% of our interviewees success was attributed to their focus on ‘doing it right’ and to the best of their abilities, a quality that was very much defined by themselves. Also, in all cases their achievement was an extremely personal one and something they were motivated to see through to the end. Bottom line: if a goal doesn’t mean something to you personally, then you’re unlikely to ever achieve it. 2. Envisioning a successful outcome. How many times have we seen F1 drivers or down-hill skiers visualising the course ahead and seeing themselves win before they’ve left the starting line? As much as 20% of the sample group’s success was attributed to their habit of envisioning an outcome in which they summon all the necessary qualities to be a success. This is often referred to as ‘positive thinking’, but in reality is much more than a matter of self-belief. Believing that we will win is enough to launch us out of the starting blocks, but to finish ahead of the pack requires a crystal clear vision of the path ahead and what you’ll do when difficult choices are presented. Bottom line: If you cannot see the outcome, then it is unlikely to ever happen. You make your own luck in life, but first you have to picture what it is that you want to achieve. 3. Persistence – the key to success. In an age of Lottery millionaires and the instant celebrity of X-Factor, our younger generation are in danger of forgetting the most important adage for success – “anything worth having is worth fighting for” – and far from being an old wives’ tale, this was still the most essential ingredient found within our successful group of interviewees. For every overnight success story, there are literally thousands who crash and burn. You can guarantee that if an opportunity exists, there will be many other people who have seen it and are plotting their own routes to success. When a competitor’s vision and resources are the same as yours, the deciding factor between winning and losing often comes down to an individual’s “sheer determination” (21% in our sample), “self belief” (7%) and “passion” to succeed (4%). Life is like a ‘Mogul Field’, there will be obstacles – that fact is guaranteed, it is how we overcome these obstacles that distinguishes the high-achievers from those who consistently under perform. Maximising your potential is as much about how a vision is implemented, as it is about having a good vision in the first place. Bottom line: He who dares, doesn’t always win. But the person who ‘never’ gives up, always achieves their full potential, whatever that may be. Our plans almost never play out as we would like them to, and whilst sometimes it is necessary to push through the obstacles in our path, it may be equally appropriate to drive around them, or perhaps even change our path if the goal is no longer worthwhile. Bonita Norris, the youngest British woman to reach the summit of Mount Everest at the age of 22. 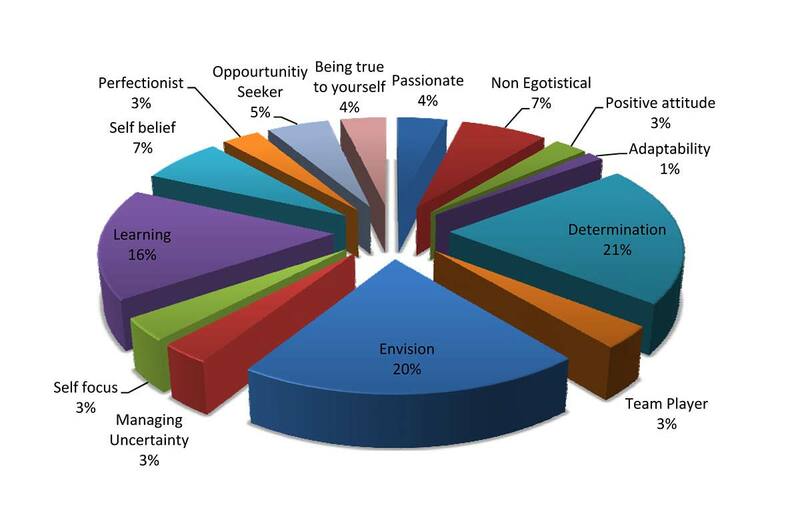 This group of traits represent 16% of the total and include qualities such as “being an opportunist” (5%), “a team player” (3%), “someone who is adaptable” (1%) and more likely to be “non-egotistical” (7%). This illustrates the importance of maintaining a holistic perspective on our journey to the top, and being prepared to fine-tune every element of our plan. Perhaps the most unexpected quality demonstrated by the interviewees in this process was their lack of ego. They were all purposeful, focused and determined to succeed but recognised that their success depended on the team supporting them. It also belies the stereotype of a ruthless sportsman or entreprenuer, impatiently pursuing their own goals. The person who maximises their own potential ‘also’ maximises the potential of their enviroment, including the people they work with. Bottom line: If at first you don’t succeed, try and try again – if you still don’t succeed, then find a better way to achieve your goal. 5. Knowledge is the fuel for success. 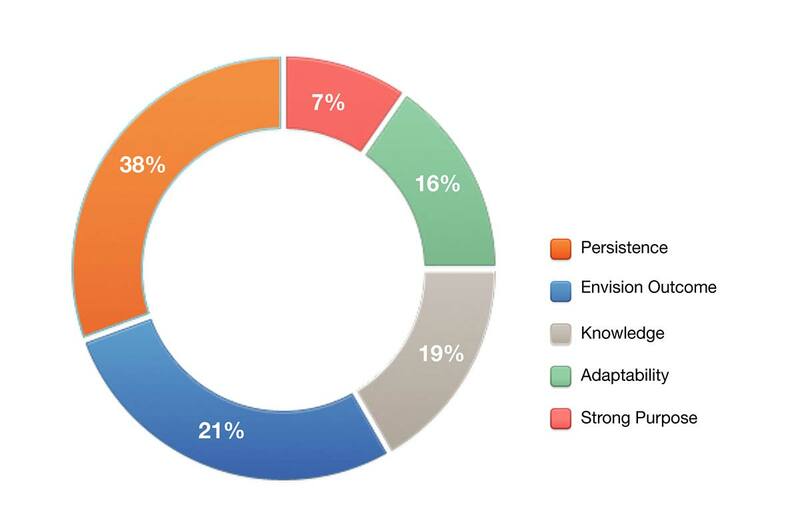 Our final group of traits is the one that glues them all together – representing 19% of the total, it includes “learning” (16%) and “managing uncertainty” (3%). Maximising our potential involves trying and failing, but failing is only a disadvantage if we fail to learn from it. Our group of inspiring interviewees have all failed, many times in most cases, but they all describe their hunger to learn from these failures and keep learning until they succeed. The quality of ‘managing in uncertainty’ might seem a strange one in this group, but is in fact an important indicator of someone who has learned how to maximise their potential. Learning how to gain knowledge swiftly and efficiently, singles out these high-achievers who tackle each obstacle as an opportunity to add to their knowledge and thereby increase their potential to succeed beyond their current limitations. Intelligence is often defined as having the capacity for learning, reasoning, understanding, grasping truths and applying such knowledge and skills in an agile and effective manner. A consistent theme across all of our achievers is the intelligence they have shown in optimising their abilities, without necessarily being the best in their field but scaling even greater heights by being the best they can be. Bottom line: Acquiring knowledge is at the very core of every successful person and it is this ‘fitness’ in acquiring, consuming and applying knowledge that distinguishes them as leaders in their walk of life. The five key traits of the high-performing achiever. An aggregated view of sub-traits after analysing their occurence in each interview and then corrected to reflect “what was inferred” as well as “what was stated”. Even though the patterns identified were common across all interviewees, there were naturally differences across the roles and occupations they performed. 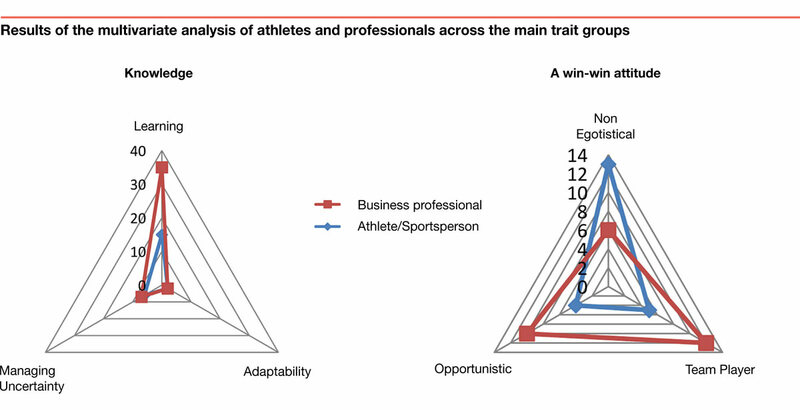 The most distinctive differences were spotted between athletes or sports people and the more structured environment of those operating in the world of business. 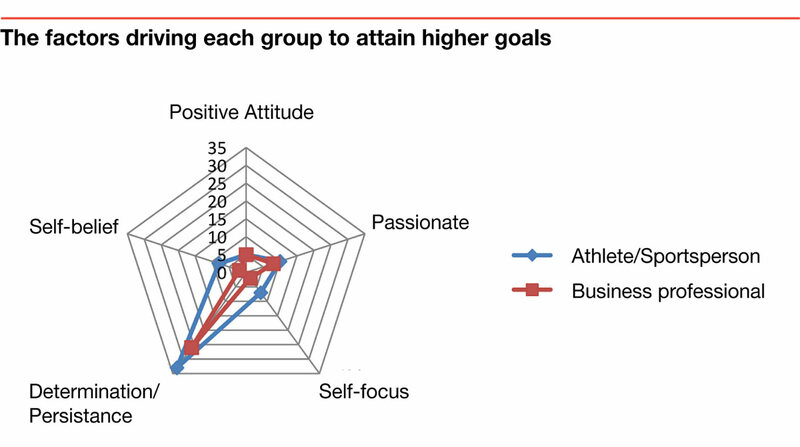 Both groups are equally passionate about their goals, but the athletes were less likely to carry an ego into their day jobs. Both were determined and persistent, but given the levels of human endeavor required to succeed in sport this was a slightly more prominent trait observed in our athletic interviewees. Whilst we used the example of a skier or racing driver to characterise those who envision an outcome, this trait features slightly more in business professionals than was evident in our sports people. Likewise learning, which was a significantly more important trait for success in business than it was shown to be in sport. Other distinguishing differences were evident in the qualities of opportunism – much more evident in business, and self-belief which was a significantly more important factor demonstrated in our group of athletes, explorers and climbers. Clearly if you fall down in business, there is usually the chance to start up again, whereas climbers or arctic explorers are rarely afforded such a luxury. Going back to the logical levels introduced at the start of this paper, we see that most of the traits displayed by our high-achievers lie in the deepest three levels (Beliefs & Values, Identity and Mission). Of course behaviours and skills are important, but they rarely enable us to distinguish those most likely to succeed. For that we must understand what ‘drives’ a person to succeed. Bottom line: Knowledge and experience can be acquired, but those who maximise their potential do so because of the mindset they possess. The great news for both business and sport is that the right mindset can be spotted and nurtured early. Potential is an ageless quality, one without regard for upbringing or social standing and if there is one thing we can all achieve in life – it’s to learn how to maximise our own potential. Steve Davies (steve@fitchmedia.com) is a business advisor and entrepreneur, who was interviewed in podcasts #4 and #6 of the Maximise Potential series. He is a former management consultancy partner at PwC, KPMG and PA and has launched several global brands and industry propositions. His work is regularly published on marketing and social media blogs, including eConsultancy and Meme Machine. Archie Davies (archie_k@btinternet.com) is a final year student at Keele University where he is studying Business and Psychology. Archie performed all the underlying research and analysis that went into this report together with extracting the implied and cognitive meanings from each interview session.